Research on ecology of the species, its relationship with human and continuous monitoring of its population status is crucial not only to inform management decisions but also to assess the effectiveness of conservation approaches. The RDT believes in power of sound science and aspires to develop innovative solutions that reconcile conservation with livelihood needs of fisher communities and foster co-existence between them. The RDT regards local community engagement and involvement as an equally essential component in addition to research for effective conservation management. Our mission is to combine applied research with conservation education and local capacity building to save river dolphins from extinction. 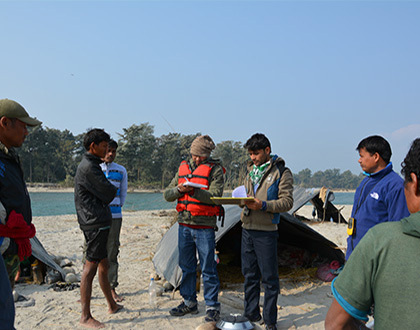 Our current research work includes i) estimating the population status of the Ganges river dolphin and monitoring its over time in Karnali river, ii) Understanding the perceptions of fishers towards dolphin conservation and documenting how do they respond ( in terms of fishing practices and area) to decline in fish catch, iii) assessing the socio-economic factors that influence fishers decision to remain or exist fisheries and their implication in the context of sustainable fishery management and river dolphin conservation and iv) assessing the conservation threats to river dolphin including the problem of by-catch (entanglement into fishing nets) and poaching.